The inspiration for this little hat came from the others I have created with a crochet hook. 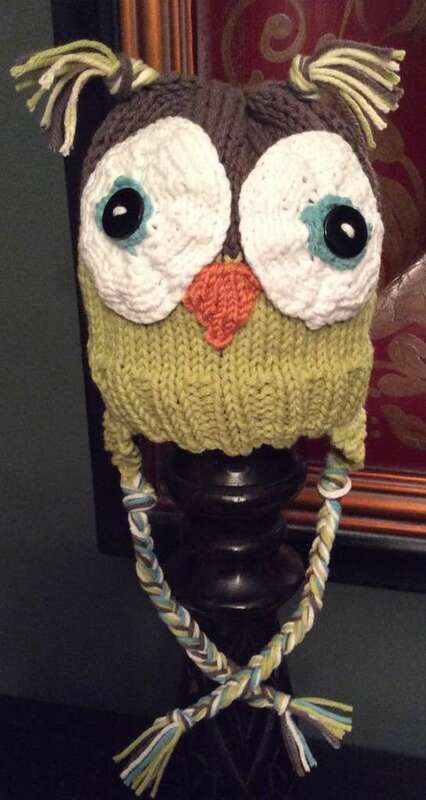 Last year, I made about 20 of these cute little hats and gave them all away. Since then, I have been wanting to create one on the looms, finally, I had a chance to do it. This is my version on it, but I am sure you can make something similar going about it a different way. I hope you enjoy making it. Yarn: Worsted weight yarn, approx 120 yds in 4 different colors, total.. Lion Brand Cotton-Ease was used in sample in colors Cactus (about 40 yds), Taupe (about 50 yds), Seaspray (about 5 yds), Snow (about 10 yds) and Terracota (about 5 yds). Notions: knitting tool, crochet hook size G.
Other: 2 medium black buttons to use for the eyes (about 1/2″). Size: Size shown fits 3-6 months. k2tog=knit two stitches together (lift stitch from peg 1, move it to peg 2, knit peg 2 treating both stitches on the peg as one). p2tog=purl two stitches together (lift stitch from peg 1, move it to peg 2, purl peg 2 treating both stitches on the peg as one). Sl=slip a stitch (skip a stitch with peg behind the peg). With CC, cast 64 sts, join to work in the rnd. Rnds 9-23:k to end of rnd. Cut CC, join MC, leave 6 inch tails on both. Rnds 24-40: k to end of rnd. Rnd 41: *k2tog; rep from * to end of rnd. Rnd 42: k to end of rnd. With O, cast on 10 sts, prepare to work a flat panel. Rep Rows 1 and Row 2, until 4 sts rem. With MC, CO 12 sts. *Row 2: sl1, p to end. Row 3: k2tog, k to last 2 sts, k2tog. Rep from * until 2 sts rem. Repeat Rows 2-9: 9 more times. On the last repeat (the 10th repeat), stop at Row 8. BO with basic bind off. Mattress stitch BO to CO. Use the remaining yarn tail end to cinch the middle off the eye close. Steam block to a flat circle/disc. BO with gather method. Cut yarn leaving a 10 inch yarn tail. Use the yarn tail to sew this piece to the center of the EYE. Sew the button to the center of the blue area of the eye. Sample was sewn with white yarn. Sew the earflaps in place as follows: mattress stitch the earflap to the cast on edge of the hat, it will be sewn over twelve stitches on the cast on edge. 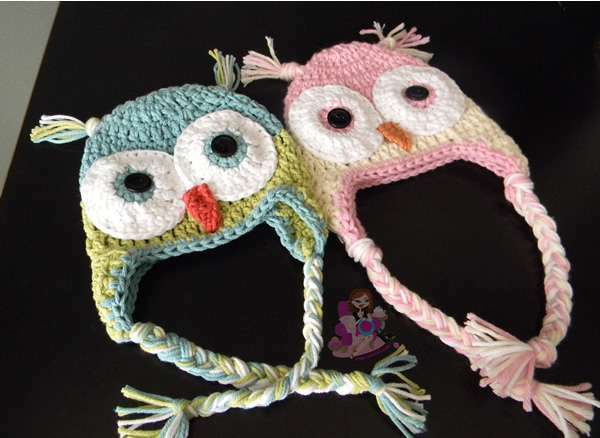 Skip 18 sts from the cast on edge, mattress stitch sew the other earflap onto the next 12 sts. Front of the hat will have the remaining 22 sts from cast on edge. 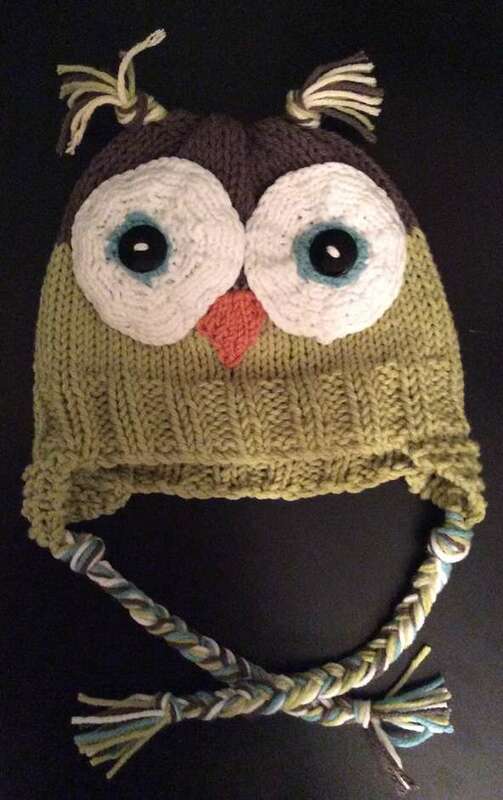 On the front of the hat, use the picture of the hat to position and sew the eyes in place. Sew the nose in place after sewing the eyes in place. Using MC, CC, and W together, leave a 16″ length and cut. 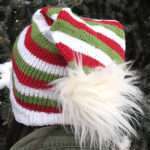 Keeping the strands together, fold in half, pass the lengths through two stitches near the top of the hat, to the top-side of the eyes make a slip knot with the length of yarn as close to the hat as possible. Trim the length of yarn to leave about 1″ ears. Do the same to the other side. Using MC, CC, B, W: cut 30″ length of yarn. 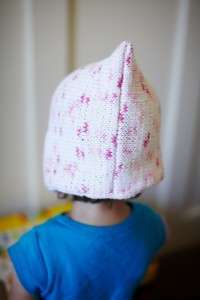 Fold in half, using a crochet hook, hook at the half point (at the fold), and pull through the last stitch of the earflap. Make a slip knot as close as possible to the earflap. Divide yarn strands into three groups (6, 5, 5) make a braid. Finish the braid with a slip knot. Trim the lengths of yarn, leaving a 1 inch tail. Here is a picture of my crochet hats, my own pattern too, and I based myself on the crochet version for the loom knitted version. On designing these, the most difficult part came to the eyes. It is very hard to knit a flat circle on a knitting loom as you are not able to increase/decrease easily. I went through 4 different ideas and finally, I did what I first thought would work but didn’t want to go that route, but it was the one that worked the best. The eyes are created flat with short-rows. I tried the increasing and decreasing in a circle and I found it to be completely a hassle and was taking the joy of the project away so I scrapped that idea. I did them flat, decreasing so that I could make a circle, the result didn’t look right at all. The short-rows was the best method that I could find for the circular flat discs needed for the eyes. If you know how to crochet, you can wip out a pair of circles in about 5 minutes flat, so you could go that route. Another option is to use felt for the eyes. Awesome, thank you so much! I love Freebie Fridays! Pick up cast on edge and place those stitches back on the loom, each peg should have 2 loops on it. Treat both loops as one loop. K to the end of the round. How would I make this for an adult? I have the aio loom. Thanks I think my friend who loves owls will love this. Mitered squares at work once again, this time, they are arranged to make a little baby sweater. The project squares are small, 2.5 square, making them a perfect take-a-long project. Yarn: Approx 460 yards of worsted weight wool blend. Noro Taiyo in color 24was used in sample (2 full skeins and about 20 yards of third skein). Notions: Knitting tool, tapestry needle, 2 small buttons (optional, you can sew the lapel down in place without the buttons). (Make 48). Each square is approx 2.5” square. Get two stitch markers that are different color. Name one marker A and the other B. Set your knitting loom to its largest setting. You want your slider all the way down to the edge. Count 12 pegs from the edge of the rail, place stitch Marker A on the peg. Then count 5 pegs from the slider and 7 pegs from the other rail; place stitch Marker B on the last peg on this rail. Using the Yarn Over cast on, cast on 24 pegs. Start casting on at the peg with Marker B. (You can use any other cast on that provides a firm foundation. I do not recommend the ewrap cast on). Working yarn will be located by Marker A.
BO: Cut working yarn, leaving a 12 inch yarn tail. Ewrap peg with yarn tail, lift the bottom loop off. Then pull the tail through to create the BO. Block all squares prior to seaming. 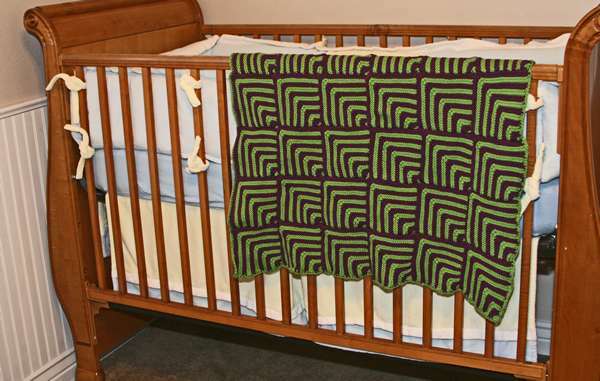 Using the garter stitch ridges, seam with the mattress stitch all the squares as shown in the diagram. The red lines show the midline of each of the mitered squares, the black line shows the front of the sweater-do not seam this area, leave it open. The neckline squares: leave two squares unattached at the back neckline and also unattached to each other at the front of the neck. The squares at this area will be folded down and secured with an accent button so the square folds down at the front neckline. After seaming the squares to each other. Seam the sides of the sweater closed. Seam the arm sleeve closed. Sew the buttons in place by folding down the front two middle squares, forming a small lapel. Secure the buttons down. Weave all ends in. Block lightly if necessary. Need extra help with the squares? We have a video demonstrating a mitered square over 24 pegs. You truly expressed that terrifically.. I loved making this. I did one in a pink and white and about to start another one in blue. Thanks for sharing. I would love to share picture but not sure how to add it on here. Summer is all about portable projects! 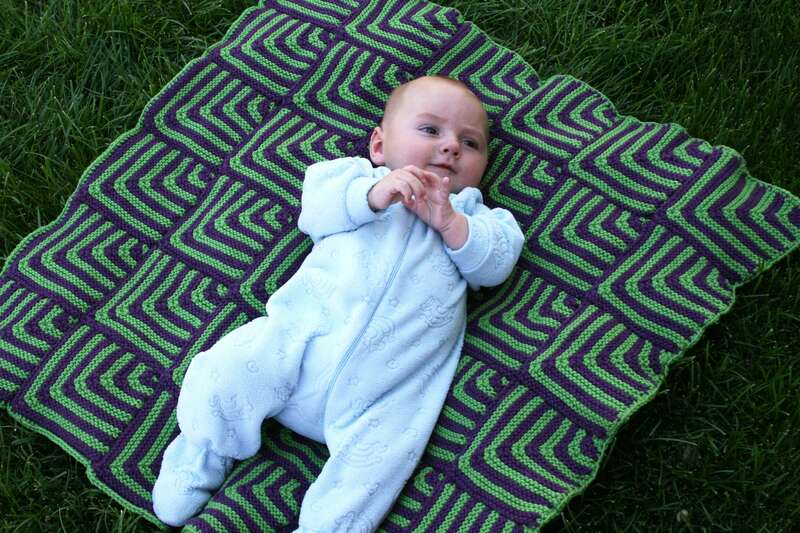 This blanket is worked in portable squares that you can take with you anywhere. You can knit a square in about 1-1/2 hours! 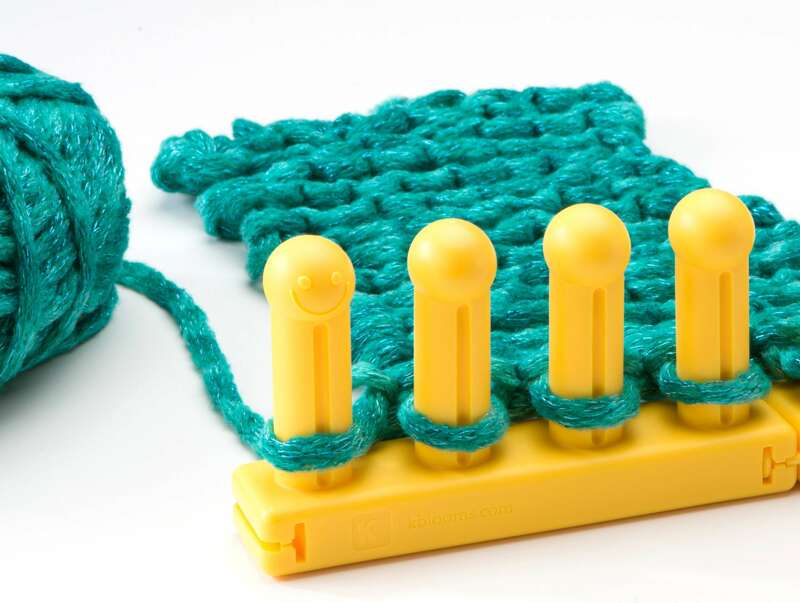 Knitting loom: Sock Loom 2, 50 pegs. Yarn: Approx 1200 yards of worted weight yarn. Knit Picks Swish in Peapod (5 skeins) and Amythest Heather (6) was used in sample. Gauge: 9 sts x 18 rows= 2 inches in garter stitch. Each square is approximately 5.5 inches x 5.5 inches. Start with A color, then switch colors every four rows. Do not cut yarns, simply carry them along the side when not in use. With MC, Cast on 50 sts, prepare to knit a flat panel. Row 1: (Going clockwise/from right to left). K23, k2tog, k2tog, k23. Slide the slider inwards. Row 3: k22, k2tog, k2tog, k22. Slide the slider inwards. Row 4: p to the end of the row. Join CC, and continue with the pattern. Continue repeating these last two rows, decreasing two stitches on every ODD row, until you have 2 sts left on the knitting loom. (On every ODD row, the numbers will go down from k22, k21, k20, k19, k18, k17, k16, k15, k14, k13, k12, k11, k10, k9, k8, k7, k6, k5, k4, k3, k2, k1). Bind off leaving a 10 inch yarn tail (used for seaming the squares together). Block all the squares prior to seaming. Use the layout below to arrange your squares prior to seaming. Use the mattress stitch to seam the squares to each other. Stabilize the blanket by crochet a single crochet border around the blanket. For charity knitted squares…25cmx25cm can this be done on on a round loom ? Trying to find a pattern for looming … As all are knitted with straight needles . Wow this looks amazing. I’m definitely going to try this. I really wish there was a short video for this. I really want to try it! The new knitting looms are also a great size to create baby hats! My son created these hats, he came up with the design himself too! The itty bitty one on the right was created on the new knitting loom in the kit, the 32 peg one. This little hat is a good preemie size hat. 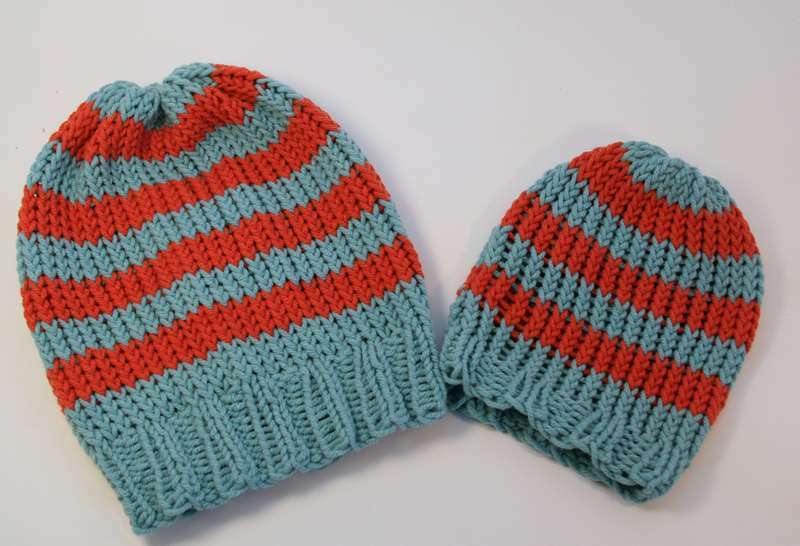 The hat on the left was created on the Sock Loom 2 and it is big enough to fit a 1-2 year old toddler. Both of these were created using the ewrap stitch. The patterns are below, enjoy! Yarn: Approx 100 yards of worsted weight yarn. Lion Brand Cotton-Ease Terracota and Seaspray was used in sample. Notions: knitting tool and tapestry needle. 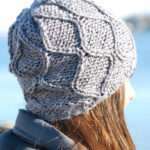 Pattern Note: Brim uses the Knit stitch and purl stitch, body uses the ewrap stitch/twisted knit stitch. Using MC, cast on 32 sts, join to work in the round. Rnd 7-10: SS. Cut MC, join CC. Rnd 11-14: SS. Cut CC, join MC. Rnd 15-18: SS. Cut MC, join CC. Repeat last 8 Rnds 2 more times. On last Rnd, cut MC leaving a 12 inch yarn tail. (Do not join CC). Bind off: Use the yarn tail to do a gather bind off method. How many pegs would be recommended for a 3-5 year old? I have looked all over to find out hhow many pegs to use on the all in one loom for a mans slouchy hat but haven’t found any . My little girl loves tutus and anything that has to do with frilly girly things. One day, she was putting one of my ruffle style scarves around her waist and it look really good, except that the ruffles were going sideways. I decided to remedy the sideways ruffles and got to work designing her a skirt. Loom: 100 peg small gauge knitting loom. All-n-One Loom was used to create sample. Yarn: 20 yards of worsted weight yarn (CY: Contrasting Yarn). 40-60 yards of ruffle style yarn, amount depends on the length of skirt you want to create (MY: main yarn). Sample shows a skirt with 1 skein of yarn. Size: S, M, L (18, 20, 22 inches). Sample shown L-fits around a waist that is 22 inches in circumference (fits a 7 year old).). Skirt length depends on the number of Ruffle yarn skeins you used. Sample shows one skein and the skirt is 9 inch in length. Gauge: Taken with worsted weight yarn: 9 sts x 12 rows =2 inches. Using CY, CCO 84 (92, 100) sts, join to work in the round. Rnd 1-8: *k2, p2; rep from * to the end of rnd. Cut yarn, attach MY. Using CY, CCO 84(92, 100) sts, join to work in the round. Rnd 1-10: k to the end of rnd. Rnd 11: p to the end of rnd. Rnd 12: 21: k to the end of rnd. Next: Move every other loop of the CY over one peg, so you have every other peg with two loops. Break yarn, leave a 30 inch yarn tail if working Option 2. Join MY. MY will be using as a ruffle, open the netting and locate the top row of eyelets/netting openings. Next Rnd: *Place one yarn loop (eyelet) on peg, skip peg; rep from * to the end of rnd. Lift over both CY loops off the peg, leaving only the ruffle style yarn on the peg. Next: *Place one yarn loop (eyelet) on peg, skip peg; rep from * to the end of rnd. Lift bottommost loop off the peg. Rep last round until item measures 12 inches (or desired length) from change of yarn. BBO. Weave MY ends in. Waist Band 2 option only: Measure waist of recipient, insert elastic between the wrong side of the Waist Band area, sew the ends of the elastic together, fold waist band, purl row marks the half way mark. Using CY, sew the cast on row to the last row of the CY area. 1. CCO means cable cast-on, correct? 3. In option 2 does “Rnd 12: 21: k to the end of rnd” mean that there is 10 rounds completed with the knit stitch? 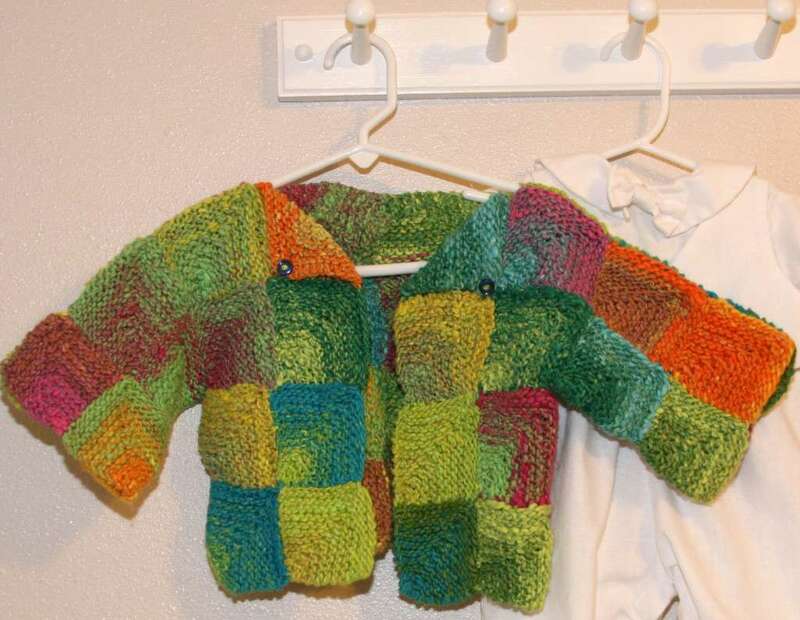 4.If using opion 2, when the ruffle yarn is added, do you complete the ruffle stitching as stated in the directions and disregard the * sign (only asking because there are no *’s in the option 2 waist band directions)? 5. I know BO stands for Bind-Off, so what does BBO stand for? Basic Bind-Off? 6. When moving stitches over to create the skipped peg, which way should I move the stitches? Right or left from my starting anchor peg? Do I take the stitch from Peg 1 and move it to Peg 2 or 99? 7. When stitching for the different sizes (84 and the 92), are there looms that have that number of pegs? 8. Would you think about posting this project onto YouTube as a follow along project? Thanks so much for this great project! 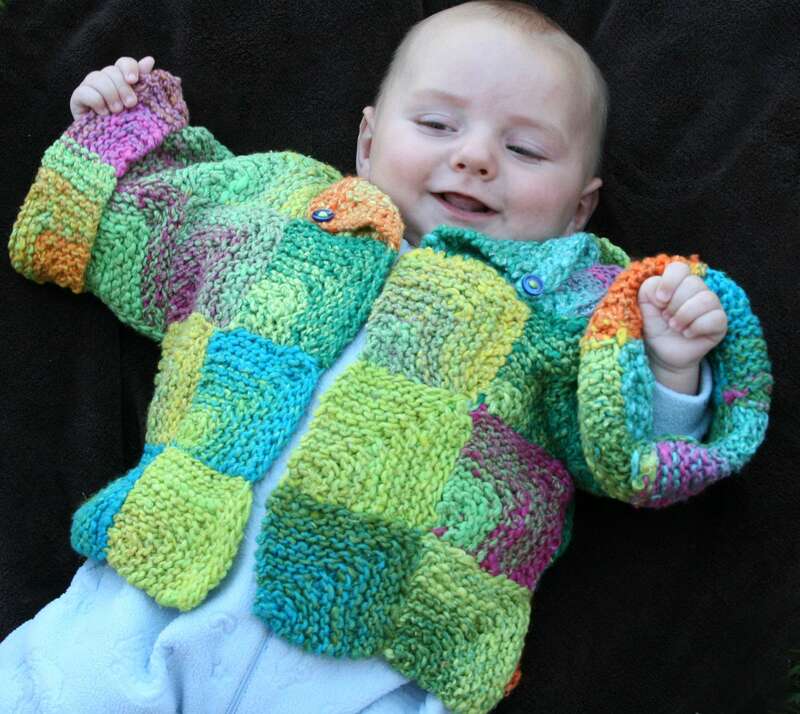 I hope to hear back from you so I can start knitting this! 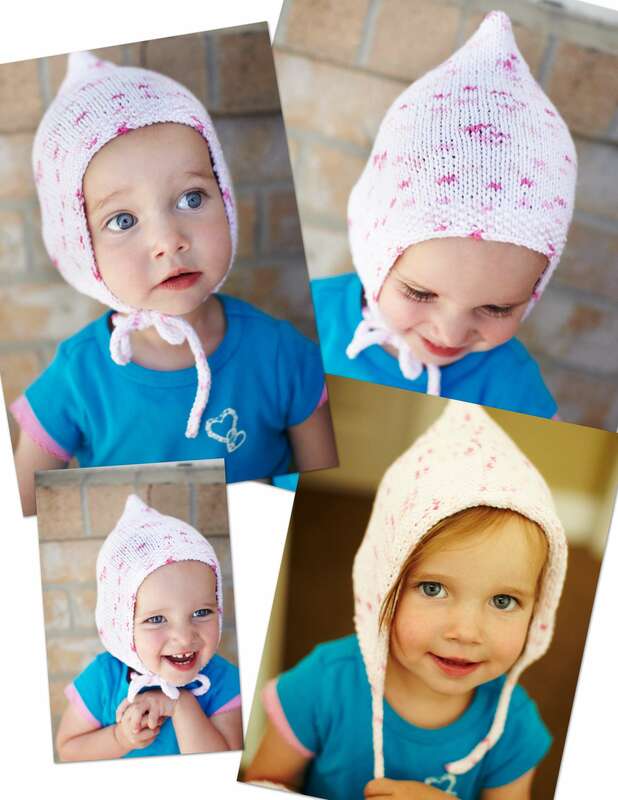 I bring you a new pattern for your AllnOne knitting loom, the whimsical pixie hat! I loved knitting this precious little hat and I was so excited when I finished it to find a little someone to wear it for me so I could take pictures. 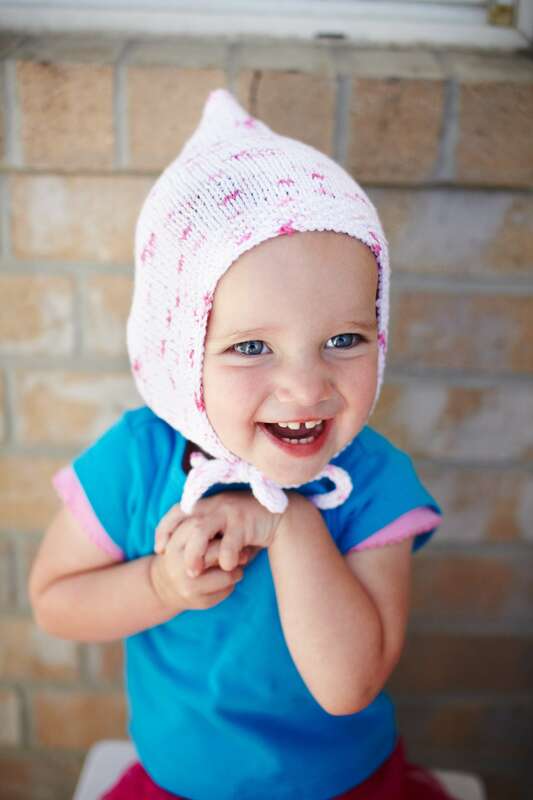 I looked and looked for about two weeks and I couldn’t find a little girl model, then came to the rescue little Lily, she is precious and so sweet and she has the perfect little face for this little hat. Thank you to the Pace family for letting me model my little hat on their beautiful daughter and to Wendell Pace from PacePhoto.com for taking the pictures for me. I hope you all enjoy knitting the little pixie hat! Size: 3-6 (6-9, 9-12, 12-18, 18-24) months. Sample shows 12-18 months. CO 65 (71, 75, 81, 85) sts. Rep Row 1 until piece measures 5 (5.5, 5.5, 6, 7) inches from CO edge. Rep last 2 rows, 2x. Work a 4-stitch i-cord, 18 (20, 22, 24, 26) inches long. Weave ends in and block lightly. Fold the rectangle in half, mattress stitch seam along the back side (see picture). Use pins to set the i-cord in place along the bottom section of the piece, making sure to leave long tails of i-cord to use to tie a small bow at the front. Mattress stitch seam the i-cord in place, remove safety pins. do i have to use all in one to make this? if not what loom and the cast on? just wondered if i had to use a all in one loom can u let me know soon. i would love to make one for my niece. You don’t, however, we haven’t tested the pattern on any other knitting loom. If you get gauge on another loom, and you have the number of pegs needed, you should be able to do it. You don’t, however, we haven’t tested the pattern on any other knitting loom. If you get gauge on another loom, and you have the number of pegs needed, you should be able to do it. Cast ons, whatever cast on you feel most comfortable using. I rarely call for a specific cast on, unless is absolutely necessary for the pattern.